Small and medium-sized companies are now able to take advantage of a more efficient way to do business. This can be achieved by using industrial robotic arms that help to promote greater productivity. All manufacturing companies, whether for small or large-scale productions, are faced daily with repetitive tasks that are best handled by a robot. Humans tend to get tired and make mistakes, thereby hampering quality and efficiency. With industrial robotic arms, companies won’t have to worry about sick and vacation time-off. These collaborative robots, or cobots, work non-stop even after hours. Their 6-axis radius enables them with a greater reach that can manipulate even the most complex environment. Varying industries have different needs. There are, however, a few well-known areas where industrial robotic arms are more qualified for the job. This is an area where quality is deemed important. Handling and packaging foods that have shorter life cycles can be costly if quality is compromised. Industrial robotic arms can be deployed in production, processing, and distribution within your distribution chain. The technology infused in their composition ensure universal food making and handling criteria are upheld. The fact that cobots minimize dust and debris build up add value to this particular sector where contamination is more likely. It shouldn’t come as a surprise how industrial robotic arms can add value to this are of manufacturing. The UR10e cobot, designed with a payload of 10kg is able to life and place heavy parts in an assembly line with greater accuracy. Employees can get hurt while undergoing rigorous tasks, but these industrial robotic arms are equipped with six levels of rotation that uncomplicates even the most cob-webbed design. They are able to save on time and cost, two of the major features embedded in the manufacturing of cars. The task of manufacturing different makes and models of plastics and polymers can be very tedious. The processes tend to get complicated because there is a high level of flexibility that is required. Different materials require different levels of processing, as well as specific temperature ranges. Industrial robotic arms cut the need for constant staff rotation at these varying levels of production. This is where industrial robotic arms come in handy. These cobots have simple designs and uncomplicated interfaces that make them easily programmable. They can be automated across different tasks and set with specific instructions. In this way, they are able to deliver high quality and with few or zero errors. The added bonus is the safety feature they all guarantee. Employees are shielded from flying shards, sharp objects, and even poisonous gases they are exposed to during the production of these types of goods. Making furniture is a highly manual field of work that relies on accuracy. Repetitive tasks lead to more errors, and more errors lead to increased wastage of production materials. The key to remaining competitive is to use industrial robotic arms in your production process. These cobots are not limited in range, but have the flexibility to automate any given task. Once complete, heavy furniture and equipment can be tedious to move from one place to another. Heavy duty industrial robotic arms that carry payloads of up to 10kg provide an easier way to complete the job than weighing down employees. Their high level of precision will ensure your product comes out with the best finish every time. They are good for bonding, placing, palletizing, welding, and a range of other building needs. 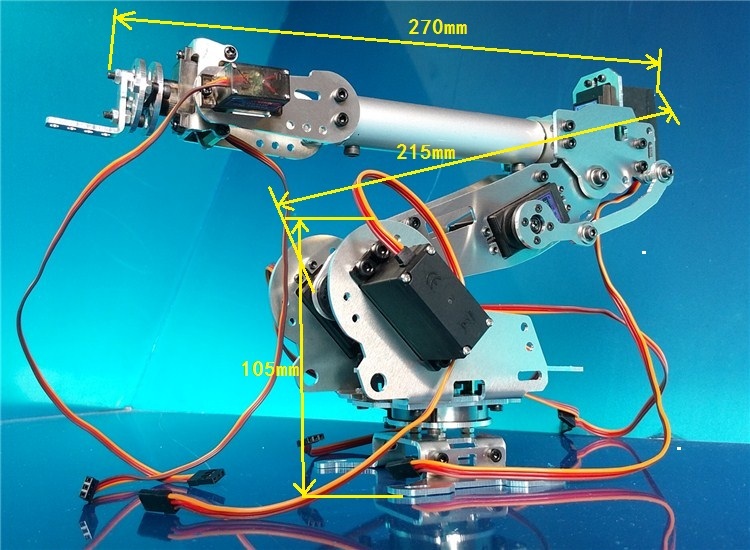 Industrial robotic arms can be used in this field of work to assist with innovation. They are consistently used to develop new technological advancements, and with the ability to work independently, they save scientists and researchers from otherwise dull and potentially dangerous tasks. Regardless of the industry or technology, industrial robotic arms add value to any workforce. They can be used across myriad platforms and anywhere manual labor is currently used. Due to their high level of automation, they are able to operate with great efficiency while minimizing or eliminating margins of error. The industries highlighted do not represent an exhaustible list, but provide a general guide as to how industrial robotic arms can be utilized in varying capacities.